The menu of Cups and Wells caught our eye when we were looking for a new place to try on the south side of town (we pre-check on the internet as a key part of the decision-making process). 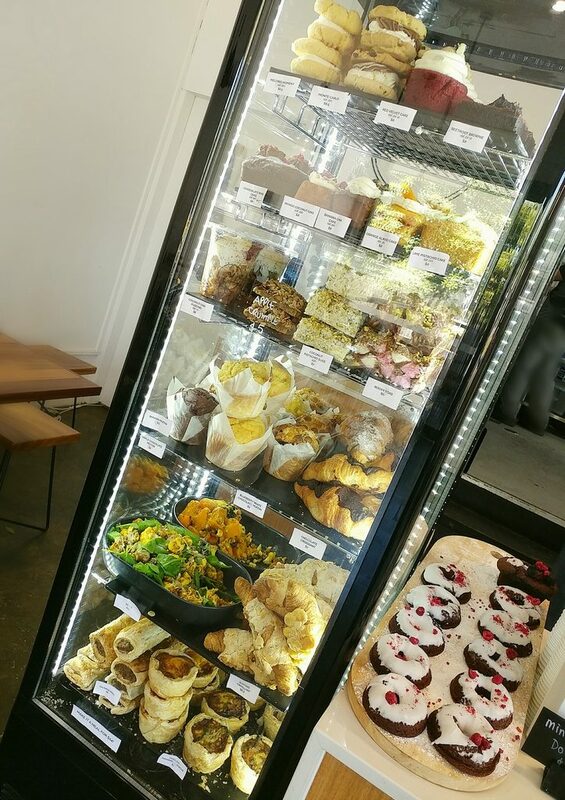 Located on a suburban street in Salisbury, the eatery’s modern styling stood out from the other shops next to it. 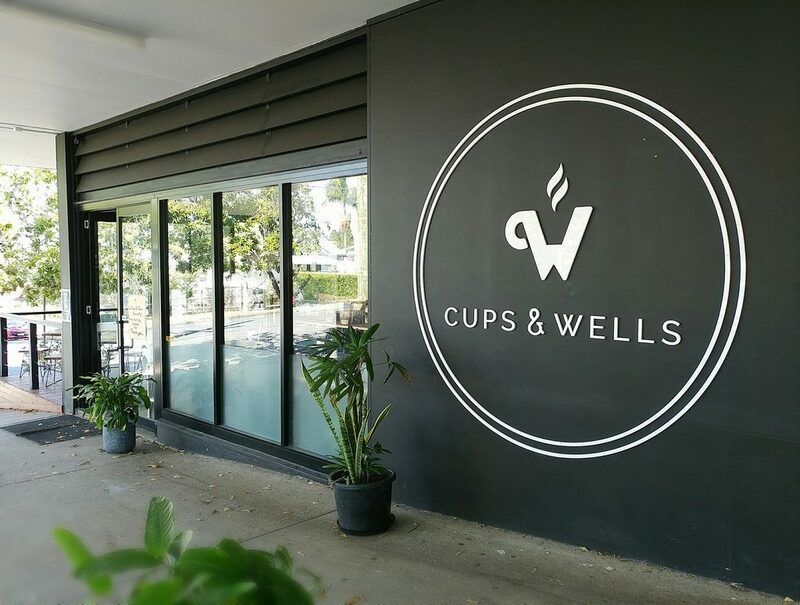 The matte black exterior wall provided a sharply contrasting background to the large encircled white lettering announcing that it was Cups and Wells, with a clever logo that combined the initials of the cafe (C and W) into a steaming cup of coffee. The rather modern exterior of Cups and Wells. 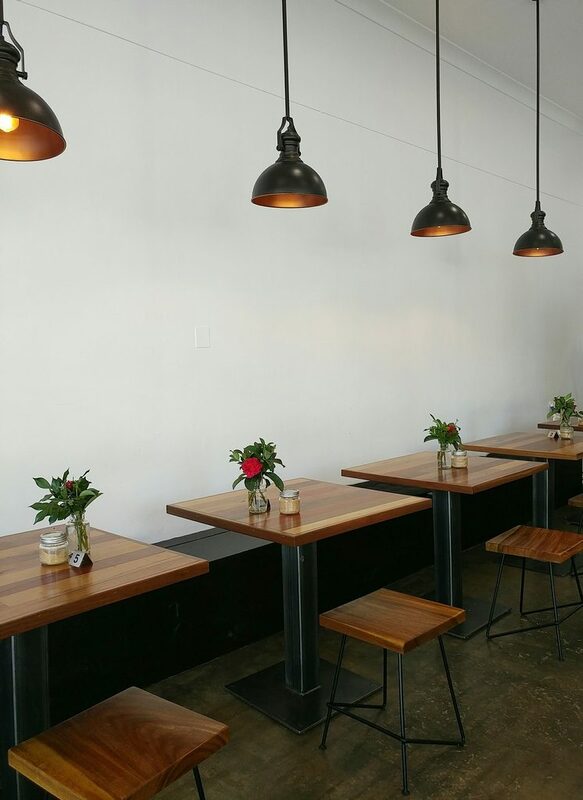 The interior space has a clean, modern look, with white walls and polished concrete floors. They have stuck to an uncomplicated colour palette of black, white, and walnut-hued wood, with the tabletops and seats in matching shades of wood, and even the inside of the hanging pendant lights in a similar caramel tone. Some of the seating space inside. We approached the service counter after entering the cafe, and were told that it was table service, and invited to sit at any available table we liked. Menus and water were soon brought to us, the water cooled in its amber bottle, accompanied by squat glasses similar to what they use at Lune Croissanterie. More of the interior space, and the service counter at the end. A bench seat runs along one wall, painted in black, with the tables that comfortably fit two against it. The tables can probably be put together to fit larger groups, but there is also a bar-height large communal table in the centre of the room. Outside is a sheltered wooden deck with a few more tables, which is where we eventually chose to sit, as it was nice weather. It was breezy but out of the sun, and as it was not a busy street, vehicles only intermittently rumbled past. For those seated inside, there was air-conditioning for when the weather got warmer (but wasn’t on at the time). 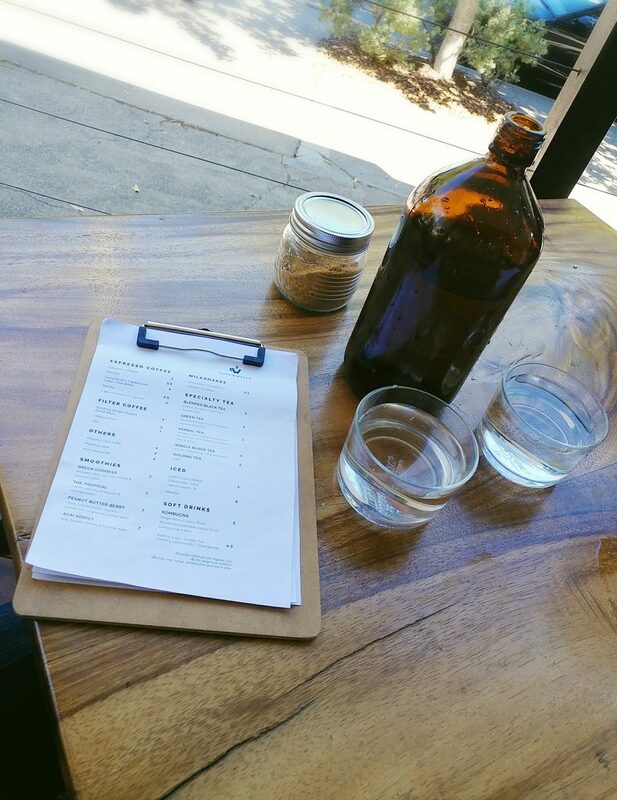 The menu was printed on a series of sheets, held together by a clipboard. In those sheets were brunch items across a couple of pages, a page with lighter savoury options (like quiches) and sweets, a kids’ menu, and drink options. 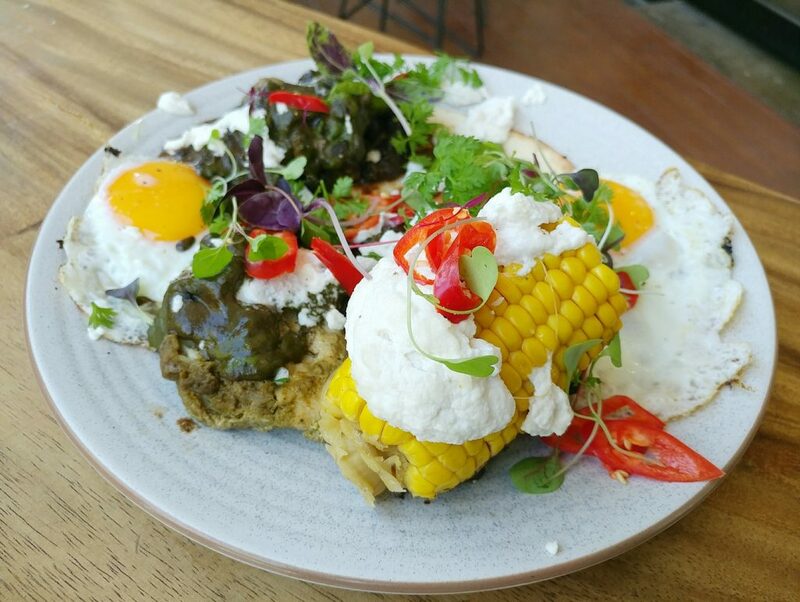 The menu had been the factor that drew us there, and it showed a range of flavour influences from around the world, with items like the Okomiyaki Omelette (Japanese), and the Gado Gado Lamb (Indonesian). 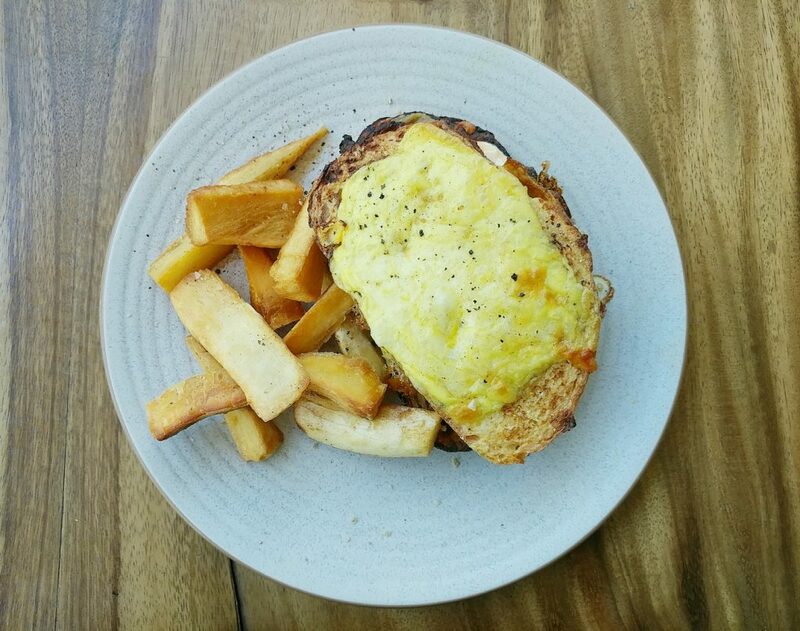 After much deliberation (the Earth Waffle was also a serious contender), we eventually decided on the Croque Monsieur and the Chicken Chilaquiles. Menu and water outside. Their tables have beautiful wood grain. Coffees were brought out first. 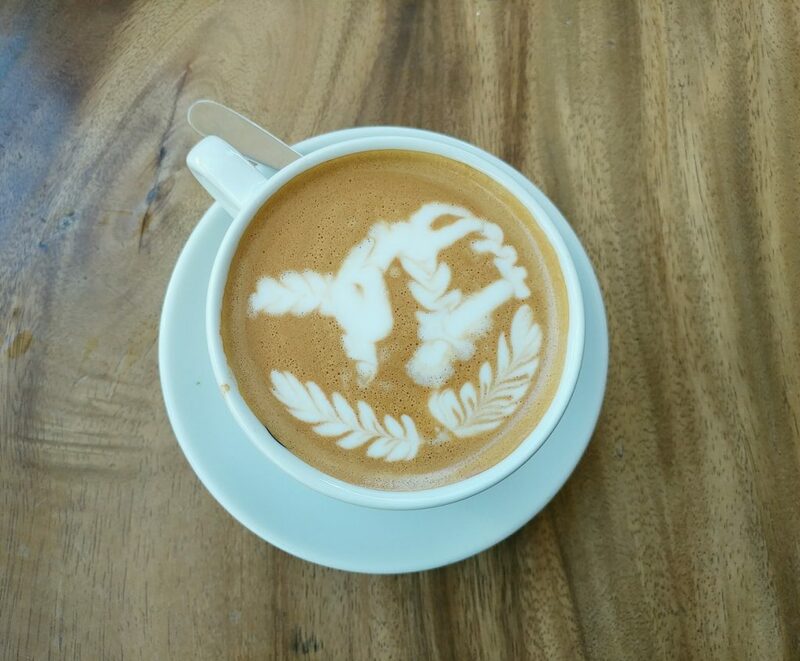 The latte art on the Flat White amused us somewhat. It looked like they had started with a plan for an interesting pattern..and then something went terribly wrong. 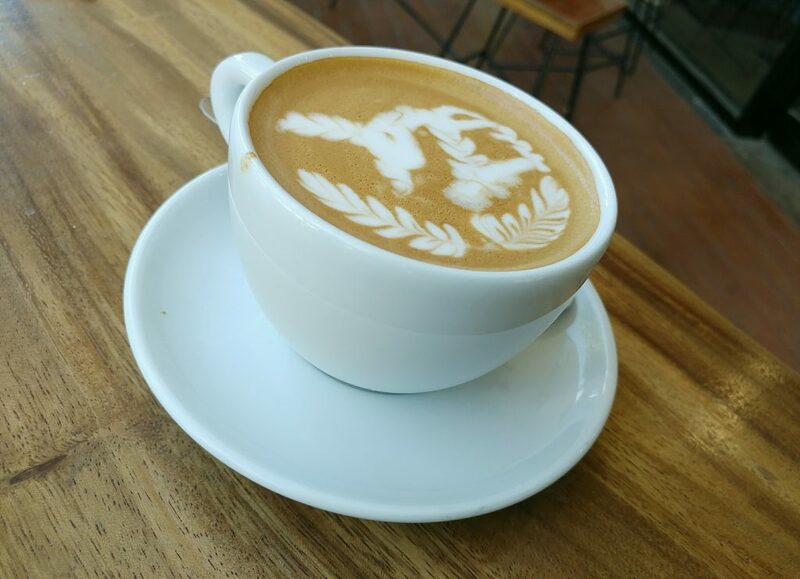 It had a good foam texture though, and a good strength. It was a little bitter in the finish, however. 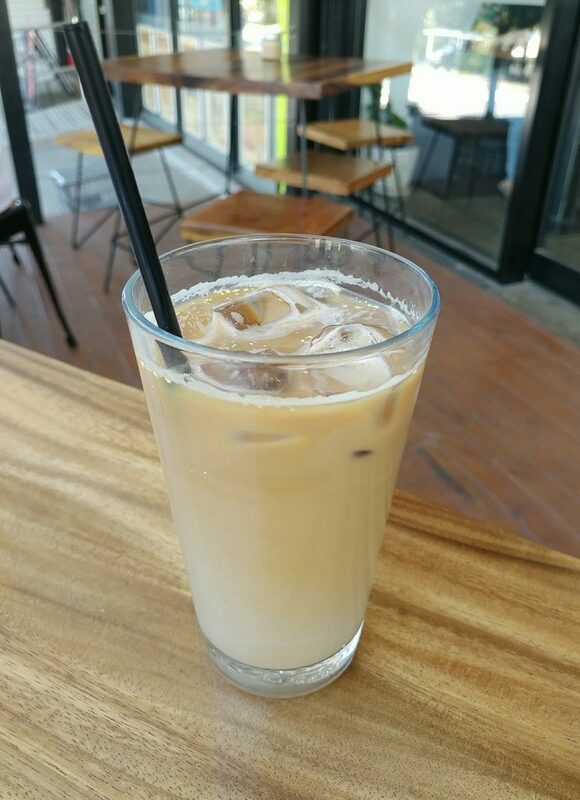 The ice latte was pleasantly chilled, and also a good strength. It had more fruity than earthy notes, but also unfortunately had a bitter finish. 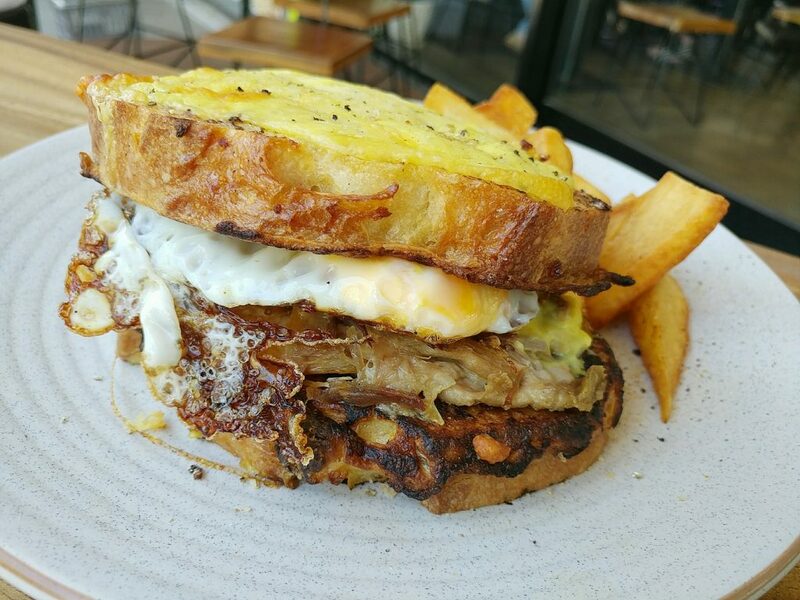 The Croque Monsieur was listed on the menu as having pulled pork, dijon mustard, bechamel, mozzarella, and cassava chips. 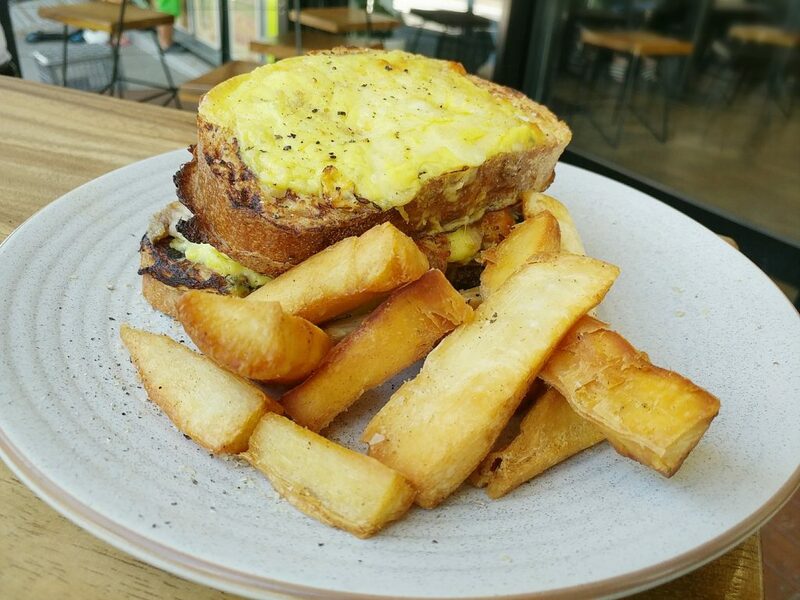 The dish certainly looked promising as it was brought to the table, with a layer of golden melted cheese on top of the sandwich. The thick cut bread slices were done like a french toast, cooked with a light coating of egg. They were just slightly crisp on the outside edges, and soft when bitten into. The melted cheese on top of it added moreish saltiness. The pulled pork was tender, and had a good savoury, meaty flavour, without being too gamey. The bechamel sauce gave the mix more moisture, but not to the point that it was soggy. The fried egg in the middle of it had a soft cooked instead of runny yolk, but that worked fine. The fillings didn’t quite go to the edges of the sandwich though. The cassava chips had a different texture to the usual accompaniment of potato chips, a little lighter, but also starchier. They were well seasoned, and nicely crisp on the outside, and had a pleasant roasted flavour. 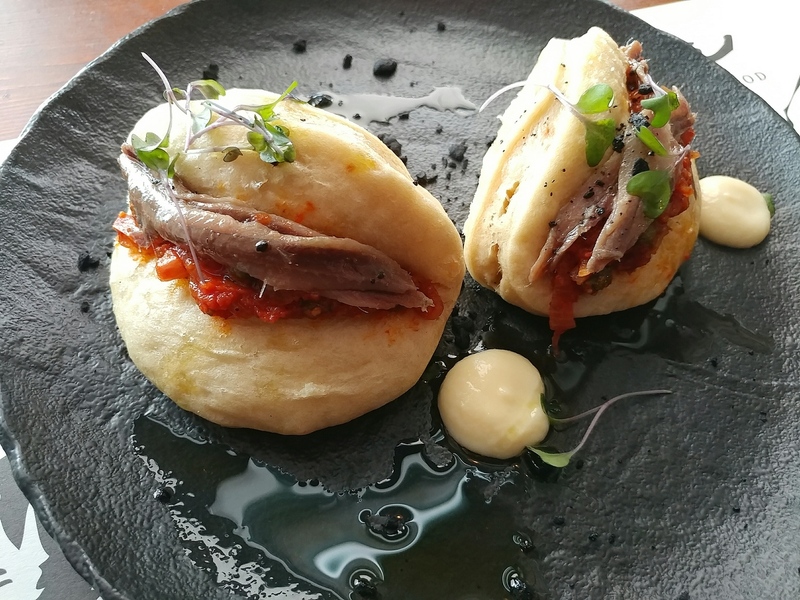 As a whole, it was a tasty dish, but we felt that it could have used more sauce, both in the sandwich, and to dip the cassava chips in. 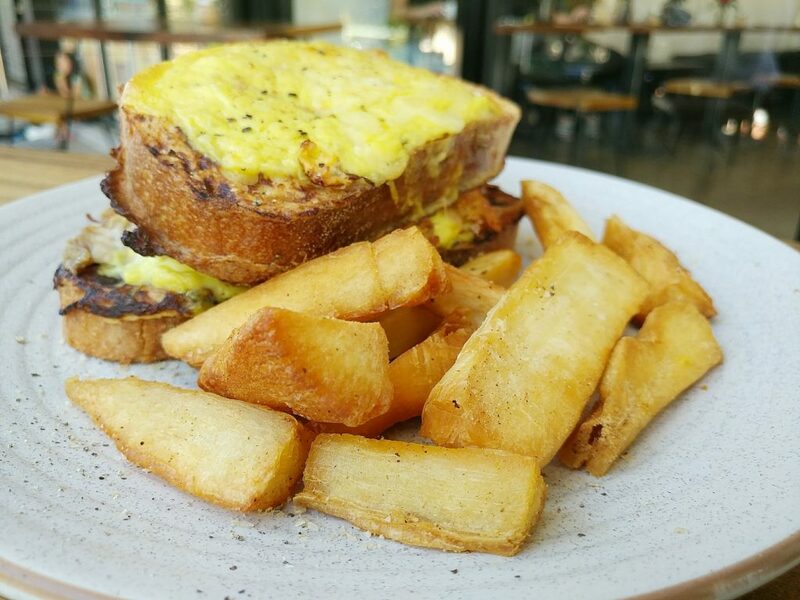 The Croque Monsieur from above, with melted cheese layer on top, and accompanied by cassava chips. 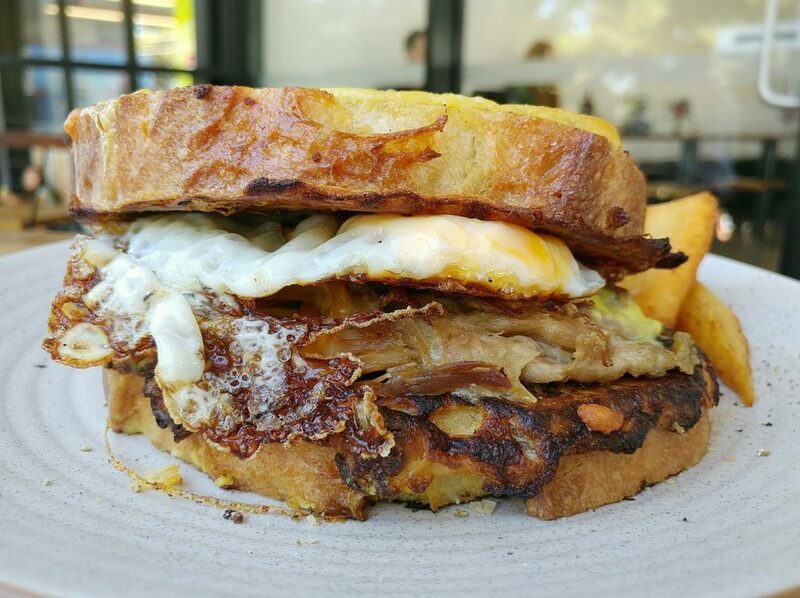 A closer view of the Croque Monsieur, with pulled pork, fried egg, dijon mustard, bechamel, and mozzarella. The cassava chips on the other side of the dish. The Croque Monsieur closer again. 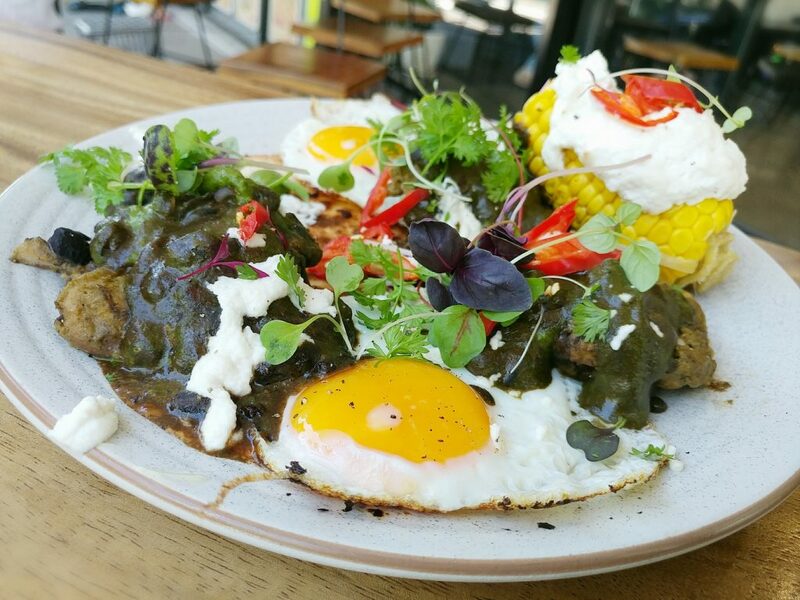 The Chicken Chilaquiles had el paso chicken, mole beans, charred corn cob, tortilla chips, almond aioli, salsa verde, and fried eggs. The plate was certainly busy, with plenty of bright colours from the components of the dish. 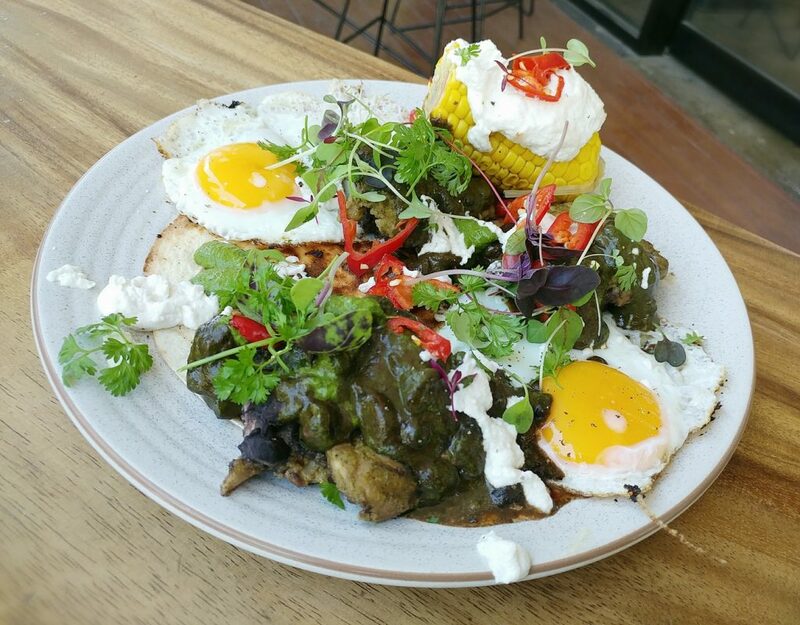 Those mole beans were a deep jurassic green, but tasted quite different from what one expected. Instead of being just vegetably, they were spicy, earthy, and a little sweet. 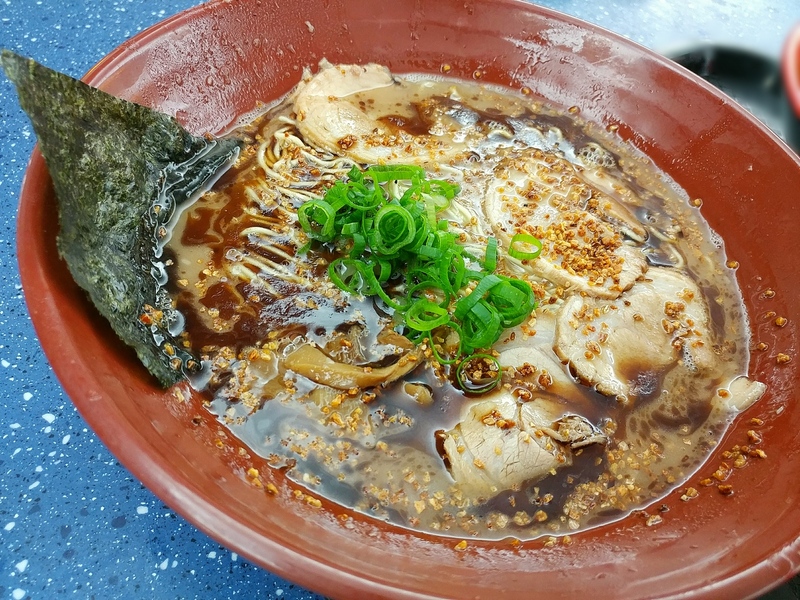 The chicken pieces were tender and covered with a good amount of the mole bean sauce. The fried eggs in this case did have runny yolks, as well as crisp edges. 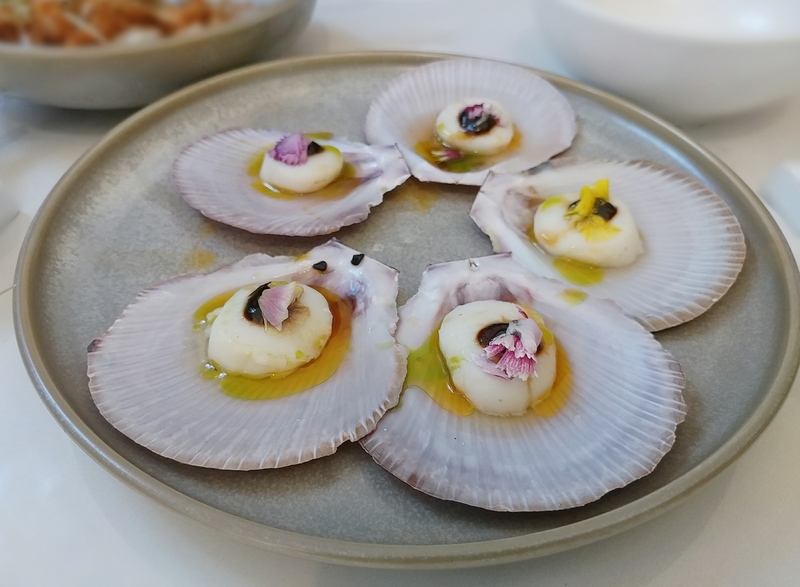 The almond aioli was creamy, and actually had a mildly gamey note, like a goat’s cheese tang. The sliced chillies added vibrant colour to the plate, and threatened just as much spice, but had the pith mostly taken out, so fortunately had a stifled fire. The sweet corn had a fresh sweetness, and a faintly smokey note. The flour tortillas making the base of the dish were soft and pliable. Although we couldn’t quite manage to wrap all the ingredients up in it (that would have been one big burrito) it worked to have as a neutral base for the other components. All together, the dish had good flavour and textural variation. The Chicken Chilaquiles, with El Paso chicken, mole beans, charred corn cob, tortilla chips, salsa verde, almond aioli, and fried eggs. Closer up, the fried egg with soft yolk. A look at the very deep green mole beans, less photogenic colour offset by the other brightly coloured components. The other side of the dish, corn and more chicken seen. 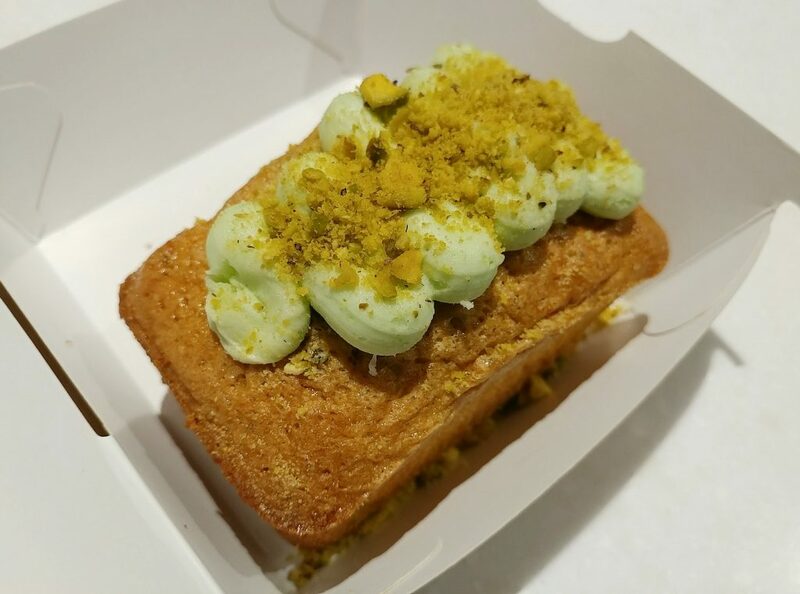 Those dishes were quite filling, but we couldn’t resist the treats in the glass cabinet near the counter as we were preparing to pay for our meal, and ended up getting a Lime and Pistachio cake to take away. An assortment of treats in the cabinet. The green frosting on top of the cake was faintly limey, but more sweet than with any tangy tartness. The cake had a fine crumb with a nutty texture, as you would get from an almond meal base. 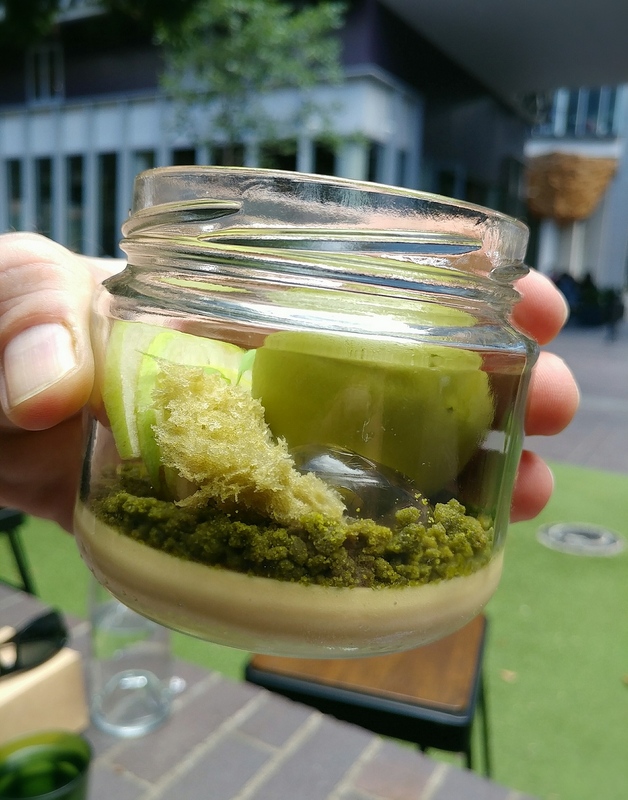 It certainly had pistachio notes in it, and was soft, and moist in the centre. 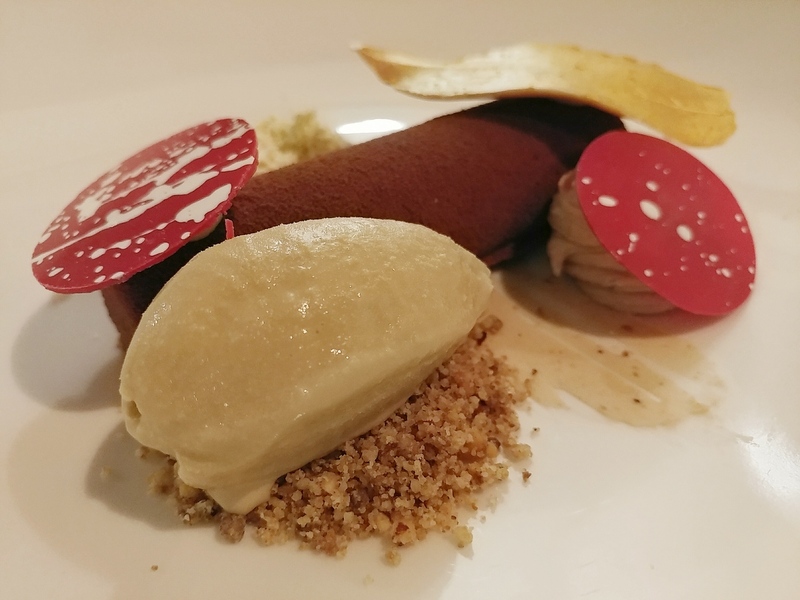 It was not too sweet, and made for a nice treat when we were less full. 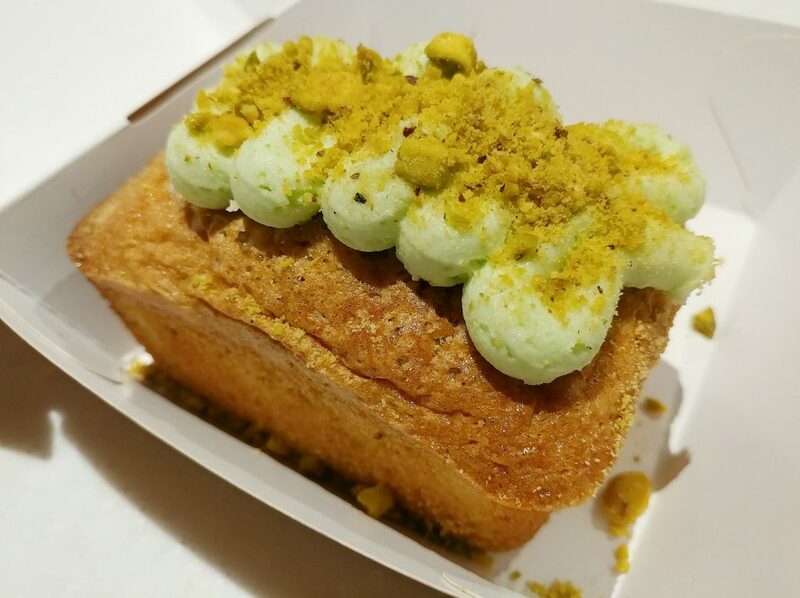 The Lime and Pistachio cake. The cake, from another angle. 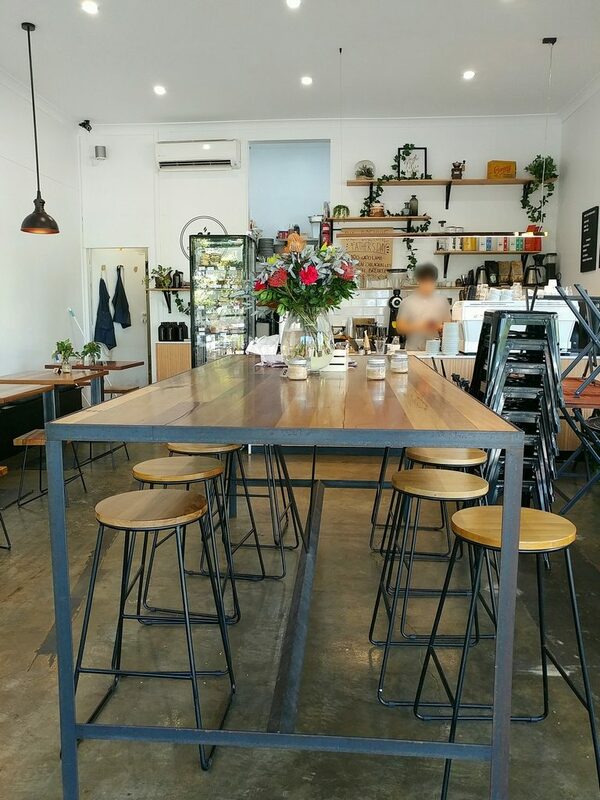 Cups and Wells is certainly a neighbourhood gem, and worth visiting for fare that is a bit different from what you would usually find in other cafes. 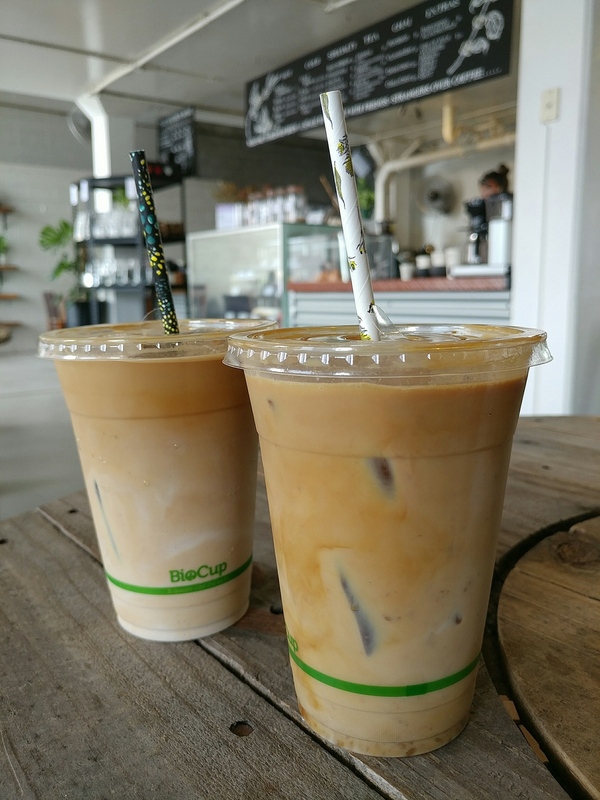 Although the coffee could use a little finessing, they have good flavours in their food, and there is enough diversity in that menu that you are sure to find something (or a few things) that appeal. 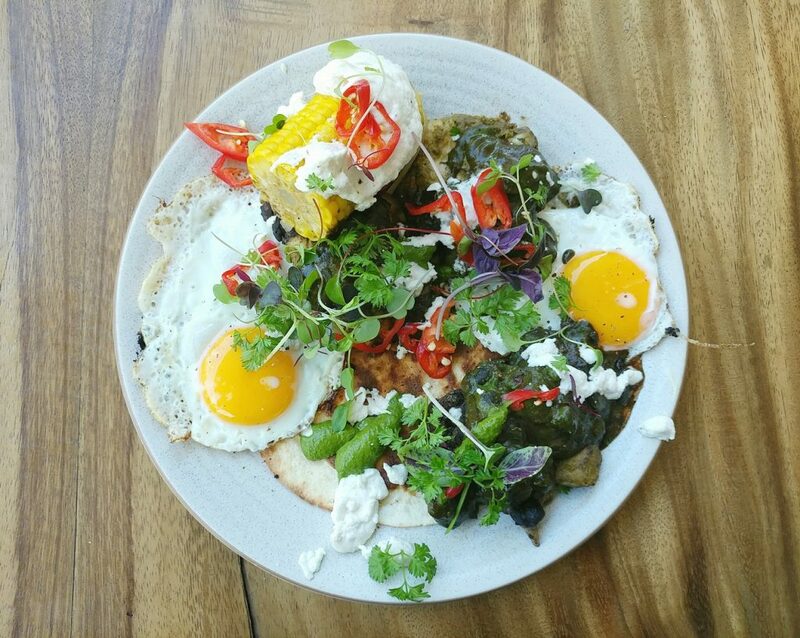 Price point: Brunch items $17 to $24, for things more substantial than toppings on toast or an acai bowl.